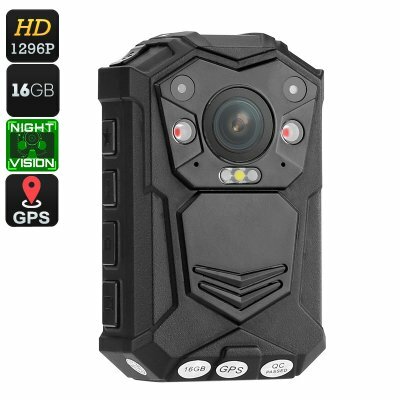 Successfully Added Police Body Camera - 1296p, Night Vision, CMOS Sensor, 140-Degree Viewing Angle, IP65 Waterproof, 2 Inch Display, Time Stamp to your Shopping Cart. This high-end police body camera is the perfect electronic gadget for private security firms, bodyguards, and bouncers that like to keep clear recordings of all that’s happening throughout their shift. Featuring a 5MP CMOS camera, this body cam produces high-resolution images and footage of all that’s happening in front of you. Additionally, its 140-degree lens ensures that nothing will stay uncaptured. Thanks to its 2900mAh battery, this body worn camera can be used for up to 10 hours continuously, providing you with all the power needed to get through the longest of day or night shifts without needed to worry about recharging your body cam. At the rear of this amazing body worn camera, you’ll find a high resolution 2 Inch LCD color display that allows you to watch back recordings instantly. With 16GB of internal memory, this police body camera packs all the storage needed to save hours’ worth or footage. Additionally, this body cam can also be used as a car DVR system when attached to your car dashboard. Thanks to its motion detection features, this camera is capable of focusing automatically on movement and to start filming instantly whenever movement is detected. With its durable IP65 design, this police body camera is capable of withstanding dust, water, and drops. Like most high-end body cams, you will be able to use it in the toughest of environments. Rain, snow, dust, or ice – nothing will stop this police body camera from recording. To increase its security features even further, this body worn camera can be connected to a walkie-talkie network, thus allowing you to stay connected to all your fellow colleagues in the area. Thanks to its built-in microphone, this body cam does not only record high-end footage but also makes sure that all sound and voice in the area will be captured on video. Featuring a powerful Ambarella A7LA50 chipset and 4 IR LEDs, this police body camera is capable of producing high-quality images at day and night. With its 10m night vision, you can be assured that even during your night shifts this body worn camera records all that’s happening in front of you and delivers sharp and recognizable images. A 16x zoom feature lets you record everything from afar and watermark and GPS features make sure that your recordings always state the time, date, and location. Providing you with this valuable information, this police body cam makes sure that you’ll never be bothered by false legal claims again. This body camera comes with a 12 months warranty, brought to you by the leader in electronic devices as well as wholesale electronic gadgets..